The Bank of Canada has once again held the overnight rate steady at 0.50 per cent pointing to continued low inflation and subdued wage growth, which the Bank judges to be consistent with continuing excess capacity in the economy. In a very terse press release, the Bank suggests that the U.S. and global economies will gradually strengthen. Weakness in the U.S. economy in the first quarter is seen to be due to temporary factors with a rebound likely in the second quarter. The Bank’s assessment of the Canadian economy is cautious. Despite what is likely to be 3.8 per cent growth in the first quarter, the Bank only commented that growth was “very strong” in the first quarter and “will be followed by some moderation in the second quarter.” There was no hint of coming interest rate hikes or other forward-looking guidance. Governor Poloz and his colleagues did assess recent economic indicators to be encouraging, including business investment, which has lagged this cycle. The economic expansion has been driven by consumer spending and the housing sector, “which is becoming more broadly based across regions.” The Bank expects housing to slow in response to measures taken by the provincial and federal governments. Ontario imposed a foreign buyers’ tax in late April and new listings in the Greater Toronto Area surged more than 30 per cent in April. Anecdotal evidence suggests that home sales have slowed thus far in May. Similar to the response to the foreign buyer tax imposed in August in Vancouver, home price inflation in the GTA is likely to slow in coming months. But the data for Vancouver suggest that the housing market has bottomed, with home price inflation likely to remain at roughly 11 per cent year-over-year. 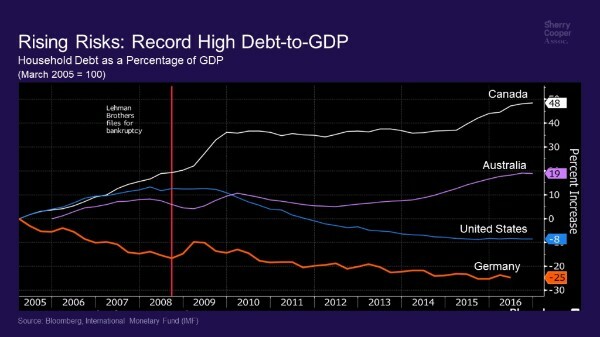 The Bank stated that “macroprudential and other policy measures have contributed to more sustainable debt profiles,” even though household debt-to-income levels have hit a record high (see chart). Exports remain “subdued”, owing to competitive challenges. Uncertainties, of course, persist–particularly on the trade side as NAFTA will be renegotiated in fewer than 90 days. Export duties have already been imposed on softwood lumber and President Trump’s rhetoric remains hostile, although the newly appointed U.S. Trade Representative, Robert Lighthizer, appears to be more conciliatory. 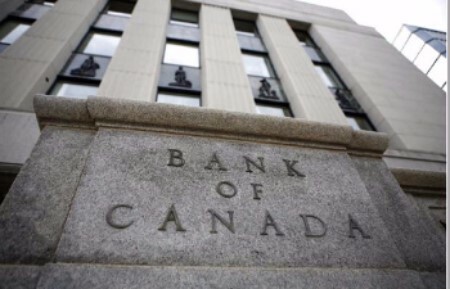 The Federal Reserve is widely expected to hike overnight interest rates again later this summer, keeping the Canadian dollar under downward pressure.